The same thing is then done for the entries at 1 and 2 in the array. These are assigned the source images of the painting The Descent of the Holy Ghost by Titian circa 1545 AD and the painting of The Last Judgment from the Sistene Chapel by Michelangelo that was completed between 1536 AD and 1541 AD. The file “ClipImage.js” contains four variables that refer to four nested HTML elements. The outermost element is the body; this element was created in the HTML file and is retrieved via a call to the getElementsByTagName() function, along with the array operator. After this, we create a div called qrOuterDiv to hold everything; this outer div is created to allow the code inside to flow normally, since it does not have absolute positioning (Otherwise, it is not needed.) The next element is qrInnerDiv, and it contains the image element that we are clipping; it is necessary that this element have its position as “absolute” and its overflow as “hidden”. Finally, the image element qrImage is 200×149 and is positioned at (125, 100) inside of the div, which is 300×200. So, the image hangs outside of the div by 25 and 49 pixels, respectively. To illustrate this, we have an resulting image of what this clipping looks like below. The faint region that lies outside the dark gray rectangle is actually clipped. We show this region so that you can see what has been clipped. 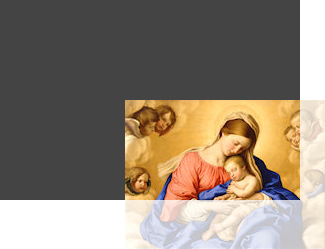 We also have the original image of the “Madonna and Child with Cherubs” that we used in the example, at the top of the article. After you have saved the new files, double-click the HTML file to open it and you should see the message “Welcome to XoaX.net!” printed just as you did before. It may not feel like much has been accomplished yet. In fact, it might seem like we have made the code more complex. However, the advantages will become more apparent when we write bigger programs.